The motor is rotated by a belt to drive the milling head, and can be processed continuously after assembling the parts. Two - stage copying contact rod. There are two compression cylinders, which are used to clamp the parts to ensure stable and reliable work. In order to improve the roughness of parts and prolong tool life, a spray cooling device is provided. In order to ensure that the milling process is always in the state of spray cooling, the spray device and pedal switch chain. The length of the positioning screw can be adjusted to ensure the depth of cutting. Before processing, the corresponding copy plate should be made according to the shape of the parts. On the square rack of the machine tool, the copy board is positioned on the left side and bottom side, fixed with screws and easy to replace. If the profile board is not used, the transverse can be limited by adjusting the brake nut, and the positioning ruler on both sides of the square can be adjusted. If the above two methods are used simultaneously, the product quality will be more stable and reliable. 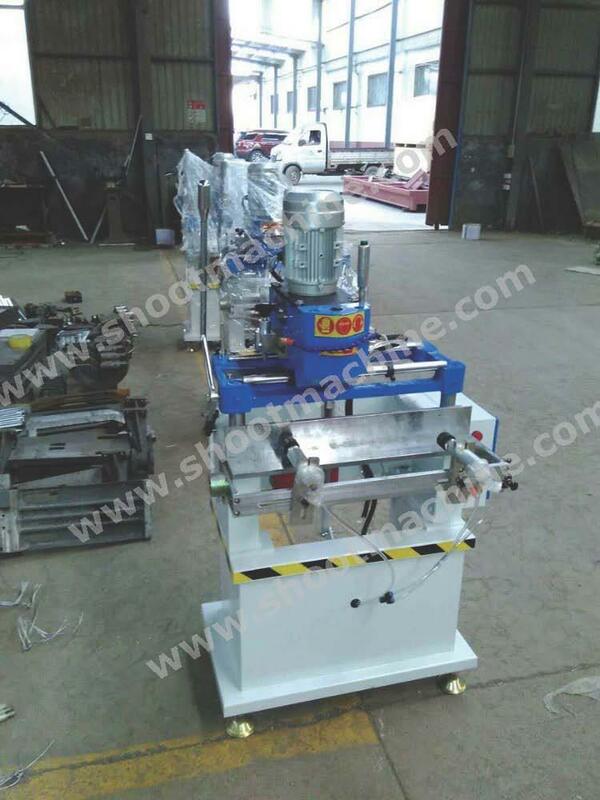 SHXF400*100 aluminum, plastic doors and Windows single spindle copy milling machine for processing aluminum, plastic profile doors and Windows of various types of holes, tenon groove, water mouth, and so on, the local structure compact, small volume, the profile clamping adopts pneumatic transmission. It is easy to adjust and replace with a large scale and high efficiency. It can achieve continuous processing and simple and safe operation. The machine is used for the contour machining of various types of holes, mortise grooves and flume of aluminum doors and Windows. A copy template and auxiliary location are adopted. Use pedal switch to control pressure cylinder, safe and reliable. Compact and small in size.